“Family travel” is a term conjuring images of theme parks and children’s museums, in between stops at local ice cream parlors. As a helicopter parent, I’m all for that safe, reliable model of away-from-home entertainment. 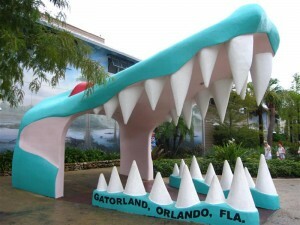 So I’m still trying to figure out what came over me when we visited Gatorland in Orlando, FL this summer. 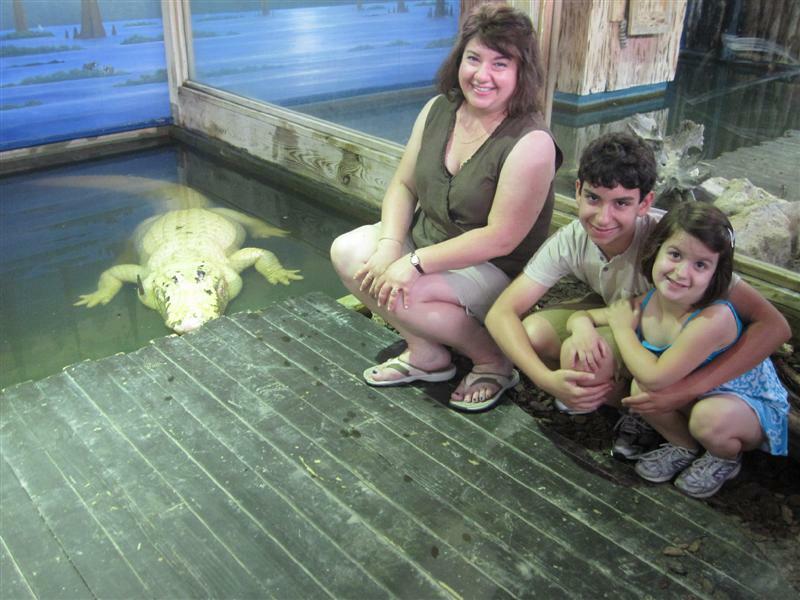 I brought my two kids into a pen containing a white, ten-foot alligator. 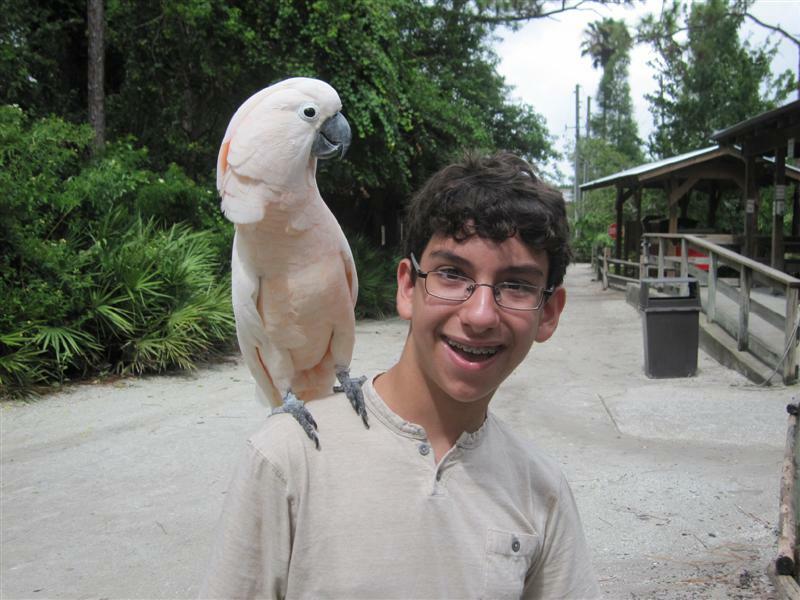 Of course, Gatorland — one of Florida’s oldest attractions – is a wholesome family outing; one which I highly recommend to get off the beaten theme park track. And we could have stayed along the sidewalks to passively view the gator habitats and the “wrestlin’” shows with their campy yet endearing theatrics. But on this day, we met Trezo Je. And I loosened my death grip on the apron strings, more than a little. Here’s how it happened: I contacted the local tourism office, which I normally do before we travel, to request assistance in planning our visits to the area’s attractions. They’re always willing to help travel writers and bloggers find great adventures, so they arranged for us to meet Tim Williams, the “Dean of Gator Wrestling,” when we arrived at Gatorland. Tim immediately put all of us at ease with his obvious experience and knowledge about all of Gatorland’s residents, which include all manner of reptilians, as well as birds, zebu, deer, and emus. Before we even left his office, our kids were wearing baby alligators on their heads. And not freaking out. 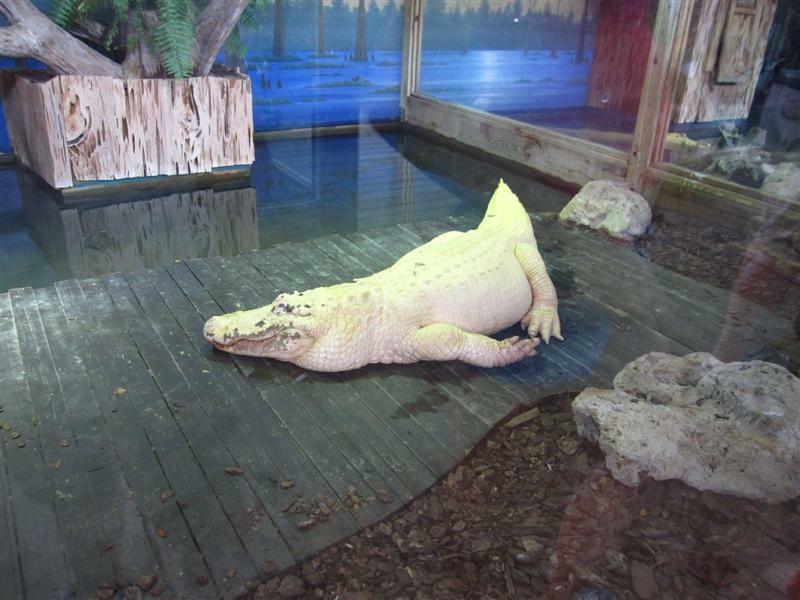 We were there expressly to see the world’s largest collection of the extremely rare Leucistic alligators. Only 15 are known to exist in the world, and four of them live at Gatorland. They have white skin, but unlike the more common albino alligator, have some color variations, as well as steely blue eyes instead of pink. While albino gators have other genetic mutations and tend not to survive to adulthood, Leucistic gators are strong, healthy… and mean. Tim introduced us to the animal trainer who works with these gators, and asked him to bring us in to the small space surrounded by wood and plexiglass walls. The trainer opened the door, Tim waved me in, and I …just…went. No dramatic protests, no time to wish my husband farewell. Then he sent my kids in behind me, and those chickens from my own gene pool followed me blindly. I’ve never really been in a trance. At my core, I’m a cynic, and hypnotists have no effect on me. But as I sat on a rock, two feet away from Trezo Je, I could stop gazing into his eyes. Matt would tell you I was frozen in fear. Yes, that was probably 60% of it. Another part of it was wonder and incredulity. Why wasn’t he moving from his watery perch? Why didn’t he lunge for The Girl, a meaty morsel who was obviously well-sized for his jaws? I sat between him and the kids (also frozen in place), but I don’t think I would have been able to do much to protect them. Nor could the trainer, who stood and watched from a five foot distance. As if! 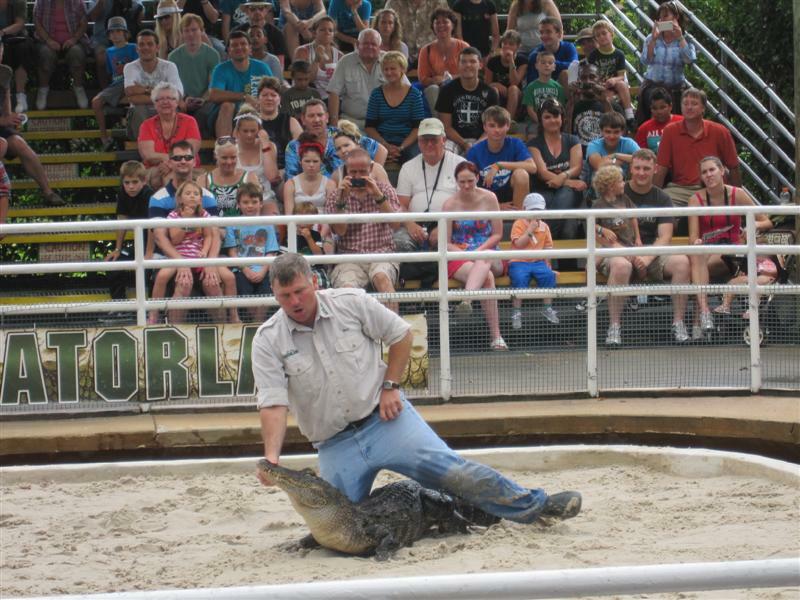 There’s so much fun to be had at Gatorland, and if you want your own meet-and-greet with the jaws of death, you can go early to the “Gator Wrestlin’ Show.” With a trainer’s assistance, you can sit astride a gator and have your photo taken. 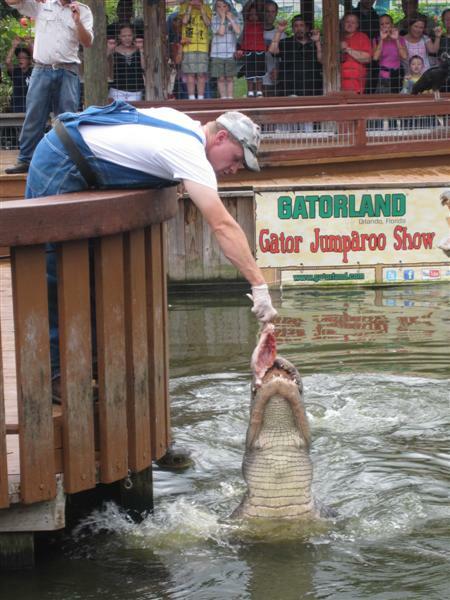 You’ll also find plenty of laughs at the “Gator Jumparoo” show, featuring two bumbling redneck types – Bubba and Cooter –who compete for a job though tests to get the gators to respond to their commands. The kids continued their fearless streak with an aviary encounter, then settled back into our normal tame routine with a ride on the train. Because it was raining on and off that day, we skipped the Gator Gully Splash Park water play area. We capped off our visit with lunch at Pearl’s Cafe, and once more nudged those boundaries by sampling gator nuggets, which were quite tasty dipped in barbecue sauce. You can have Space Mountain. I met a gator! That looks like a terrorized smile to me! I can’t believe that you all went into the gator cage and I also can’t believe that they serve gator nuggets at a gator park. Nice report though. We might have stop next time we’re in Florida instead of driving right past as we have been doing. 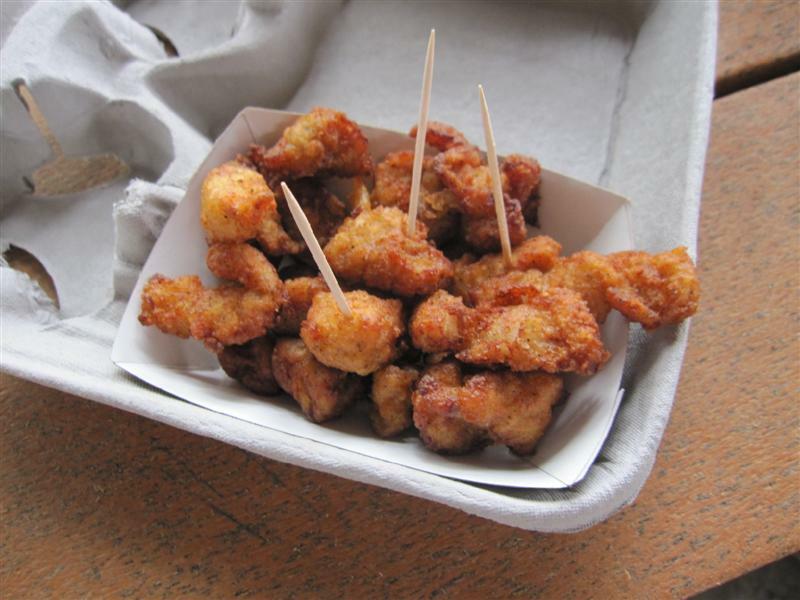 Am I the only one who finds it strange that you sampled, or worse that they serve, gator nuggets at Gatorland??? They don’t serve mouse fritters at Disney World, or Otter Pops (get it :), at Sea World. Just seems a little insensitive to me. By the way, you mentioned that “With a trainer’s assistance, you can sit astride a gator and have your photo taken.” So……..those pictures didn’t seem to make the post why exactly? Love your page… came upon it when I googled Carnegie Museum, and just wanted to tell you how entertaining and informative it is. You’re great at this and as a Mom, what a great opportunity you’re giving your children… way to go! Thanks so much, Rachel! I’m glad you found us through the Carnegie Museum post. Both the science center and the natural history museum were excellent. Pittsburgh really surprised me with its wealth of family cultural attractions; we would definitely return! I think you and I have slightly different versions of not freaking out Traci. 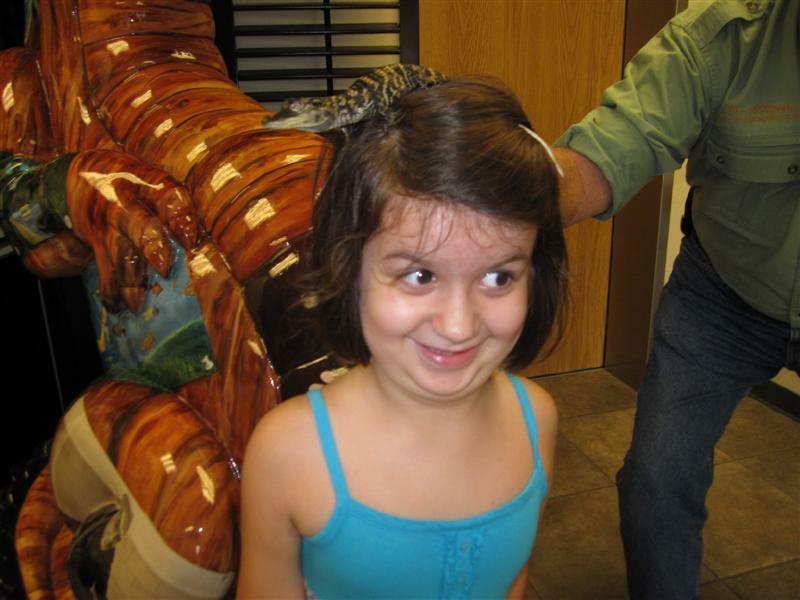 Your daughter looks like she’s about 2 seconds away from losing it, but good for her for letting the baby gator on her head to begin with. Gatorland didn’t make our list of places to stop this year, but it was under consideration, and it sure looks like it would be a lot of fun. She does look like she’s about to run screaming from the place, but she was actually pretty jazzed about it! Now she’s showing this photo to anyone who will look at it. I feel bad for her Kindergarten teacher at her first show-and-tell! Looks like an exciting visit. I too visit an endless number of kids museums and the like….its nice to do something exciting and different every once in awhile! LOL chicken? No, it has its own flavor :). You should definitely check out Gatorland sometime, they have a splash pad for the kids, a small train that goes around the park and I think they just opened a zip line. Wonderful! Nice photos. It looks like you and the kids really had a good time. I swear, Orlando has so much to offer! I’ve never even heard of White Alligators! The next time I am in Florida, I must make a trip to go check this out, swamp life is so fascinating. I spend most of my time in Palm Bay though, right outside of Orlando- so much cheaper and right on the beach! I learned how to sail the last time I was there, it was great! I love staying at the Palm Bay Hotel (www.palmbay-hotel.com). Cheap and easy!